Please ensure that AERBT is on your mailing list for cruise news. We are particularly interested in off-beat stories for our discerning audience. You have to go back well over 50 years to trace the history of Swan Hellenic. Combining cruising and cultural tourism in Greek waters seemed a good idea to the fledging Swan travel company in the 1950s. Persuade renowned archaeologist Mortimer Wheeler to become a guest lecturer, make the trip all-inclusive and you had to be on to a winner. The idea was to market the package as an educational holiday for discerning and generally mature travellers who wanted no hassle and a seamless experience. The early ships were not the latest in terms of amenities and luxury, but offered good value as long as you looked the other way in some respects. Nothing has really changed regarding ship or product. Nor clientele. Minerva, the current “Swanners” (the name given to Swan clients) vessel, was built in 1989 for the Russian Navy to be used in Northern waters. Before completion the hull was sold and a major conversion undertaken by an Italian shipyard emerging much as it is now, a 12,500-ton 320-passenger specialist cruise ship. Swann Hellenic is today owned by all Leisure Group’s Voyages of Discovery which seems to specialise with ships of curious ancestry. Its fleet includes Hebridean Princess, as chartered by The Queen, which started life as a Scottish inter-island car ferry. Last year it purchased the equally alluring Alexander von Humboldt, 15,000 tons and currently under a travel trade charter. Minerva is a finely tuned splendid little vessel, clients happy to put up with its idiosyncrasies, in particular the cabins, the majority small by the standards of modern cruise ships. 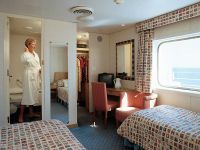 Two owner's suites are provided and ten further balcony cabins. The better accommodation is generally booked up very quickly. All accommodation is well provided for with flat screen TV, safe and hair dryers. Because of its size Minerva can get into ports unsuitable for the majority of cruise boats. Big ship cruising regulars will note that often ports are overwhelmed when their vessel has docked as passengers roam around. This is never the case with Minerva. When mooring offshore Zodiac tenders are available for the more adventurous. Minerva has a sea water ‘dip’ pool, a pair of hot tubs and outstanding library “open all hours” and trusting of passengers' honour. It is probably unique in that its history includes two different spells under the same (Swan) brand. 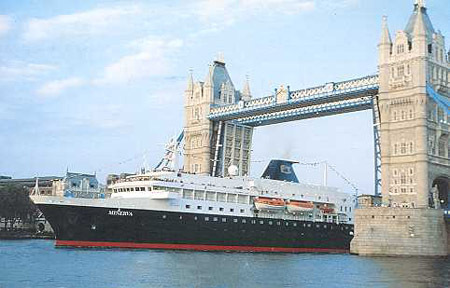 In 2001 the company was purchased by P&O, and the ship replaced by Minerva II (now Adonia), one of the R class Renaissance vessels. Swan Hellenic did not fit in when Carnival purchased P&O and the brand was sold to Lord Sterling/Roger Allard’s emerging Discovery cruise company who promptly chartered back the original Minerva. “Swanners” gave three cheers. There was nothing wrong with Minerva II except it was perhaps too big. “Swanners” clearly require something more discerning. So what do you get with Swan Hellenic and Minerva? On offer is a total all-inclusive holiday from the moment you arrive at your departing airport (if you are embarking at some foreign point) until you return. For UK ports a coach service is provided. You need not put your hand in your pocket again. The package includes all the tours (with the exception of some alternative specialist visits), and of course the quality briefings that precede each port. Diplomats, Cambridge dons, experts on rain forests, and marine ecology are the norm. Depending on the cruise an authority will be on board. And they can’t escape after their discourse. They too are part of the “Swanners” family. Don’t expect high level evening entertainment. The ship caters for a mature clientele and except for the occasional lecture and musical recital post dinner time is quiet. If you have been on a couple of trips during the day enough is enough. There is tomorrow to look forward to. A little live light music is sometimes provided. For the formal nights a black tie dress code is the norm, or a lounge suit. The ship's brochure calls for a jacket and tie for the dining room in the evening. Tipping is not required. Clearly if alcoholic drinks are wanted you pay for them but they are not expensive. Coffee is served after dinner but some people prefer specialist varieties and this does go on the ‘extras’ bill. 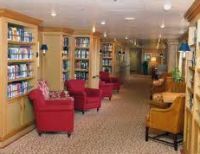 Furnishings around the ship are of top quality and there is a proper cinema on board although the majority of talks are given in the main Darwin lounge. There is no casino and wheelchair accessible accommodation is very limited. There is a self-service laundrette and a valet offering. A small gym and a beauty salon is provided as is an internet facility. A doctor and nurse are on board. Smoking is permitted in designated areas. Dining is open seating and the quality of food matches and is even perhaps superior to the previous management. Swann Hellenic does not offer special catering as such but if you are a vegetarian, or non-meat eater just inform the maître d' and the kitchen will go out of its way to help you. You can eat in the restaurant or the more informal veranda area. Morning coffee and classic afternoon high tea are provided. The friendly service is exemplary. PROGRAMME: For the early part of summer 2011 Minerva is based at Portsmouth and offers mainly 15-day itineraries to France, around the UK, the Baltic and Norway. It then departs to the eastern Mediterranean and will visit the Black Sea. In early December there is a passage of the Suez Canal followed by a slow meander which takes the stately little ship as far as Singapore before making its way back to the Gulf, through the Canal once again and on to Alexandria. Belfast may have been the birthplace of the most infamous ship of all time (Titanic) and 100 ago the world’s shipbuilding centre. Today it is making a comeback as a place for large cruise ships to visit marking up 33 vessels for 2011. Crown Princess, Crystal Serenity, Seven Seas Voyager and the latest Adonia are amongst the many ships calling this coming summer. Joe O'Neill, Commercial Director at Belfast Harbour, said the harbour had continued to develop and invest in port facilities, which had "enabled Cruise Belfast to successfully attract an increasing number of cruise liners to the city. Celebrity fans will be pleased to learn that the cruise operator, part of Royal Caribbean, is to introduce the Far East into its programme. Celebrity Millennium, a 90,000 tons vessel and these days considered a mid-size cruise ship, will visit nine countries new to the brand, including Vietnam, Thailand and China during the 2012/2013 during the Northern Hemisphere’s winter period. Disney Cruise Line has unveiled its design plans for the 4,000-passenger Disney Fantasy, which is scheduled for launch next spring. Whilst essentially as sister ship to Disney Dream (including the AquaDuck, the semi-thrilling water coaster onboard), there are a few new elements. New is "Animation Magic" a dinner show taking place in the Animator's Palate restaurant and featuring a salute to animation, starring Mickey Mouse. "Disney's Aladdin – A Musical Spectacular": Rub the lamp and new stage entertainment appears. This Broadway-style show will occupy the 1,340-seat Walt Disney Theatre. Bibbidi Bobbidi Boutique, the theme park stalwart makes the leap to the high seas. Kids can be transformed into princesses and pirates, courtesy of a staff keen on giving wee ones the royal treatment. Grand Princess has returned to service after Princess Cruises most extensive refit ever. The ship’s 24-day dry dock that transformed it from top to bottom also made the ship a media star with daily video updates that attracted more than a half million views. Hapag-Lloyd, emphasising its desire to been seen as a strong competitor in the British cruise market, chose the Royal Geographical Society in London to unveil its plans for 2012 and especially 2013. Work will start later this year on Europa 2, not a replacement for Europa (how can you replace the most highly rated ship in the Berlitz/Douglas Ward cruise guide?) described as “casually elegant” rather than “traditional” coming in at around 40,000 tons, 258 suites and 360 staff. Delivery from the St Nazaire yard in France will be in Spring 2013. 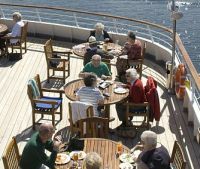 Orion Expedition Cruises has released an expanded range of path less travelled itineraries for 2012 including rarely visited destinations from polar ice cap to the tropics. In addition to existing itineraries Orion takes a fresh look at New Zealand with new Pure New Zealand and Bay of Islands voyages. P&O has now has a small cruise ship, the first for a very long time. Named Adonia by Dame Shirley Bassey, one of the former R class vessels, and formerly Royal Princess, the 710 passenger ship will cater exclusively for an adult clientele. She is currently on a 16 night maiden cruise to the Western Mediterranean, which including calls to Alghero in Sardinia; Portofino in Italy; Sete in France; Port Mahon in Menorca and Barcelona in Spain. Portsmouth International Port has hosted one of the most iconic and legendary cruise ships ‘Sea Cloud’, a spectacular 80-year old four-masted visitor. Arguably one of the most beautiful vessels available to fare paying passengers her cabins and public areas are the last word in luxury, a modern day cruise experience with a very special old world charm. Star Clippers guests from niche tall ship operator have removed 1,700 pounds of rubbish from North Friar’s Beach and Keys Beach in St Kitts in a beach clean-up operation organised by on-board marine biologist, Mariano Peruzzo. This is the third time Star Clippers guests have take part in beach clean-ups, on this occasion joining volunteers from a local charity to rid the island’s beaches of plastics and other litter. Swan Hellenic, which is featured in this issue of AERBT, is offering no single supplements on a selection of summer 2011 cruises, perfect for those who wish to travel by themselves in the company of like-minded individuals – but without the extra costs.